Monday morning Liz, of Raganella Botanical Solutions, and I went to visit Brooklyn Brine's pickle factory in the Gowanus. Supersweet Shamus, the owner, was kind enough to take us on a tour, share some tips on growing a small business, and also share a bitchin' recipe for fried pickles. The business advice was at once sage and full of youthful enthusiasm. To summarize: Start small. Do what you're doing well and with a dedicated heart. Be open to growth as well as the experience of confronting, and learning through, the challenges that growth presents. Dredge a pickle in a mixture of all purpose flour (or finely ground cornmeal) and seasonings. Try lots of black pepper, smoked paprika, granulated garlic, salt, and dried dill. Dip pickle in a batter mixture. Try flour and beer! Fry in a pan with some oil. I went to the feminist zine fest on Saturday. The place was packed with young feminists who wanted to share their art, words, and experiences, to listen and be heard. Pretty awesome. 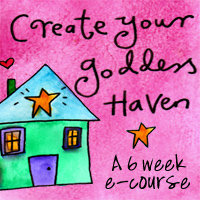 Creating Your Goddess Haven e-course starts 3/1! Goddess Leonie, Aussie artist and cheerleader for all things spirit lifting, invites us to join her and 100s of other women for Creating Your Goddess Haven, a 6 week soulful home improvement e-course beginning this Thursday. "Are you tired of having a home that feels cluttered, uninspired, dirty, and definitely not a sanctuary for the soul? Get decluttered and divinely inspired in just six weeks with this comprehensive decluttering and sacred space clearing course!" I'm pretty organized and clean at home, but I'm curious about feng shui and how to use crystals, herbs, smudging and sound-clearing. I wonder if any of those could help me be more effective on marketing and writing days when I work from my "desk." It's the card table we use as a dining table and it's also facing the side of huge humming fridge. Need I say more? I want fresh ideas on how I can make a special space to do the work I love from our little apartment. To participate, you can register for the e-course ($89) which includes projects, a video, worksheets, e-books, 25 minute original guided meditation, and a bonus sacred sound clearing MP3. Or you can sign up for one year membership to the Goddess Circle ($99) to get this course; download and/or participate in a gazillion other life-altering meditations, workbooks, e-courses; and enjoy more sisterhood than you ever imagined. *I'm a member of the Goddess Circle, as well as a Goddess Ambassador (think New Age Avon Lady). If you have any questions about the circle, feel free to ask me about my experiences here in the comments, on Facebook, or via email. HAVEN is my new local green biz blog crush! I've just discovered HAVEN, (@brooklynhaven) a Brooklyn-based green cleaning products manufacturer. I haven't tried their goods yet, so I can't vouch for their effectiveness, but the packaging looks simply scrumptious and so does the list of ingredients! 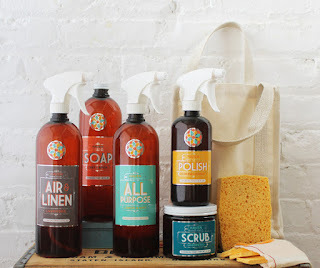 I am having fun reading the Haven blog, which is teetering with cleaning and organizing tips I can't wait to try at home, especially this one for DIY air freshener. Has anyone out there reading this on the double-u double-u double-u used HAVEN products? What was your experience? Sending much love to the ubersweet Elissa at Green in BKLYN shop in Clinton Hill for directing me to this company via her newsletter! You can buy HAVEN goodies and lots more there. My Brooklyn bedroom window, complete with gates! Ha! Open your windows! Let fresh freaky February Spring-like air circulate into your home or office. If you haven't already made your bed--you rebel, you--pull back the sheets all the way and let the fresh air take out all the nasty little micro-organisms that love damp, dark places. Vinegar & Baking Soda: BFFs? Not so much. Many times when I mention I'm a professional green cleaner, people share their "recipe" for an all purpose cleaner: a mix of vinegar and baking soda. I love when people are as excited as I am about cleaning, but I usually have to burst their bubble on this one. Baking soda is alkaline/ base and vinegar is acid. They neutralize each other. Sometimes the process of them neutralizing each other is helpful (as in the case of the baking soda and vinegar "volcano" unclogging pipes). However, if you are just mixing them together in a bottle to create a cleanser to have on hand, you do not get the pH benefits of each. You are taking a longer and more expensive approach to making a neutral/ water-like cleaner that doesn't assist if the stain actually needed an alkaline or acid cleaner, as most stains do. Meaning you'll have to put out lots more elbow grease to pick up the slack, and it still may not work. Yuck! Do keep baking soda and vinegar in your green cleaning kit, but use them wisely. Soon, I'll be sharing more recipes and explaining why they work. Stay tuned! This weekend I cleaned my fridge. I also replaced the boxes of baking soda with fresh ones. What do I plan to do with the old baking soda? I usually save it to unclog drains, but this time around I'd like to use it to make a drain freshener with instructions from HowStuffWorks. You can keep your drains clog-free and odorless by using the following homemade noncorrosive drain cleaner weekly. Combine 1 cup baking soda, 1 cup table salt, and 1/4 cup cream of tartar. Stir ingredients together thoroughly and pour into a clean, covered jar. Pour 1/4 cup of mixture into drain, and immediately add 1 cup boiling water. Wait 10 seconds, then flush with cold water. Flushing weekly with a generous amount of boiling water also works well. I'll report back with the results of my experiment! Have you tried this before? 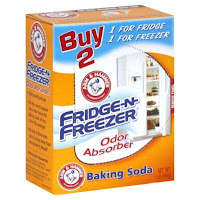 What do you usually do with the baking soda from your fridge once it has served its time?